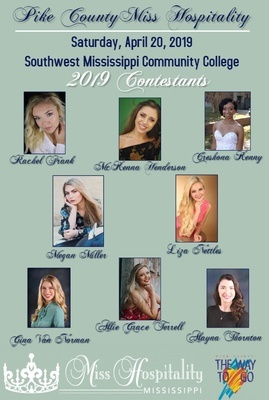 The mission of the Mississippi Miss Hospitality Pageant is to identify, honor and utilize young ladies between the ages of 18 and 24 for the purpose of promoting Mississippi's tourism, industry, and economic development internally and externally by serving as the state's goodwill ambassador. 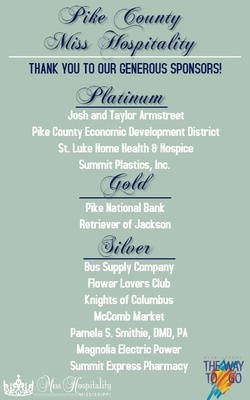 Since 1949, the Mississippi Miss Hospitality Pageant has celebrated the intelligent and gracious qualities of young women across the state. 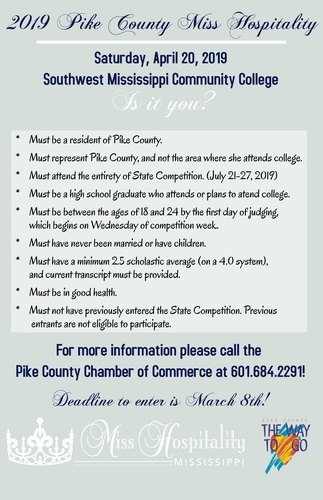 The 2019 Pike County Miss Hospitality Pageant will be held Saturday, April 20th at Southwest Mississippi Community College and will include an interview and an evening gown competition complete with on-stage question.